In Monstrous Little Voices, editors Jonathan Oliver and David Moore have collected five novellas all set in a greatly enlarged version of Shakespeare, with a host of characters spilling out of the pages of his dramas and comedies to interact with each other in ways good and ill, many of them showing us sides of their characters we never saw in the plays or offering up “what happened next” versions of their ongoing stories. And so we meet, amongst others, Miranda some time after she left her father’s island (from The Tempest) to join that “brave new world” she never could have imagined; Orsino and Viola (Twelfth Night), well-suited in marriage long after all the disguises have been stripped away, and a darkly frightful Scot-Who-Shall-Not-Be-Named whose famed dagger stalks throughout the stories wreaking havoc wherever it goes. Though the five novellas can stand independently of each other (I’ll review each separately below), the collection as a whole has a linear chronology and a shared narrative background — political turmoil and looming war in the Mediterranean, centered on the Medici family — and some of the same characters and plotlines are threaded in and out of multiple tales. The stories do vary somewhat in quality, but nowhere near as much as is typical in my experience with anthologies. There’s nary a weak one in the bunch, just ones I prefer over others, making Monstrous Little Voices an easy recommendation. Finally, with regard to the general collection, I should probably deal with the question of whether you need to know Shakespeare in order to enjoy the tales. But to be honest, that’s a hard one for me. Being an English teacher, and someone who has not only read these plays but taught many of them multiple times, it’s all but impossible for me to put myself in the mindset of someone who doesn’t know them well or at all. There’s no doubt that knowing the plays will add a richness of emotionality and humor to the stories, as when a character notes that she knows exactly why Friar Lawrence left his hometown or when Benedict talks of how much he loves his wife’s sharp wit. And even knowing the stories, the many political entities, alliances, and enmities can get a bit bewildering, meaning those coming cold will probably be even more lost. That said, one of the reasons Shakespeare is still performed, filmed, and read (and enjoyed) today is because his themes and subjects are pretty timeless, and those same themes run throughout Monstrous Little Voices: betrayal, the hunger for power, love, transformation, grief, regret, one’s role in the world, magic, the temptation of evil, the allure of the fantastical. And while those alone should suffice for readers unfamiliar with Shakespeare’s work, the author’s have also updated many of them for a modern audience, dealing for instance with issues of gender identity and particularly of female agency. Miranda, who has long been suffocating in her marriage to Ferdinand, takes advantage of a life-threatening failed childbirth to fake her own death (with the help of Ariel) and leave the “brave new world” of men, a much more stifling world than she’d expected, for a hopefully more free life amongst the faerie. She is introduced to Puck by Ariel and joins him on his penitent walk (no faerie roads for him) to Queen Titania’s court, where she’ll ask the Queen to take her own, though such a request does not come without risk. As she and Puck journey, the story flashes back periodically to revisit Miranda’s time on the island with Prospero, offering up a much darker version of their tale than Shakespeare did. The theme of Miranda seeking her own way in the world, a journey that began back on the island, is a compelling one, as is the joint theme of a desire to be freed of social restraints of gender identity, even if Meadows at times is a bit too on the nose with them. They work better when we come to them a bit slant, as when Ariel early on asks Miranda if she loves Ferdinand and Miranda replies, “Compared to what,” leaving the reader to imagine Miranda alone on that isle save for her father and with no knowledge of men or women, of the various forms of relationship between them or of the constraints placed on women by society. I preferred those moments over the bluntly laid out explanations, though those are written well enough. Similarly, I felt Meadows overdoes it a bit with some of the revelations of what occurred on the island, as if not trusting that Miranda’s desire for an agency of her own was compelling enough. The story would not have been harmed at all for loss of that subplot and, I’d argue, even strengthened. That said, the story is well told, well constructed, and Miranda’s ultimate goal is one any reader can empathize with. Pomona, a none-too-powerful witch, is heading home when she comes across a strange walled garden that turns out to be the prison of Vertumness, an envoy from Oberon to Pomona’s master Duke Orsino, who was waylaid by Queen Titania due to an old grudge. The ambassador’s absence has set the region abroil, with Oberon accusing Orsino of murdering his envoy and Viola suspecting Don Pedro of setting it all up to force Oberon into the war between mortal states. Pomona is a wonderful character — older, strong, with a bit of an edge to her as well as a bittersweet sense of time having passed her by. I quite liked how this story began, and its general development as Pomona and Vertumness interact, but it wrapped up a bit too quickly and neatly for me, albeit in a familiar Shakespearean marriage-story sense, so I guess one can’t complain overmuch. This one, I thought, was the weakest of the tales, though it is still pretty good, focusing on Lucia de Medici’s attempt to discover why the destiny her seer mother prophesied for her has suddenly gone dark and/or off the tracks. To learn what has happened, she must journey to a cave for another prophecy, enter Prospero’s tower, and interact with Macbeth’s deadly (and perhaps sentient) dagger. There is a darker edge to this one and a sense of underlying remorse that worked well, though I personally thought the ending was marred a bit by the portrayal of Prospero. But that’s a pretty subjective response. This was my favorite of the collection, a wonderfully rich, evocative, and sophisticated story that brings together a host of characters (including several of my favorites) and, more than the others, plays with structure (always a plus for me) and, on several occasions, even breaks the fourth wall. There’s magic, political intrigue, betrayal, redemption, humor, suspense. And the character of Macbeth, which — in a nod to theater folklore, is not to be named — is absolutely gripping. Loved this story. This is another strong entry, probably my second favorite of the five. Barnes takes a risk by choosing to go with a second person POV and to focus on Shakespeare’s wife, and both decisions pay off. The story is nicely impressionistic, metafictional, and does a nice job of illuminating the darker side of creativity. My only complaint beyond the minor quibbles noted above is that the last story leaves several plot strands and characters dangling a bit. A sixth story wouldn’t have been a bad idea, especially given the quality of these five. But as I mentioned in the more general part of the review, Monstrous Little Voices, as a whole, is an easy one to recommend. 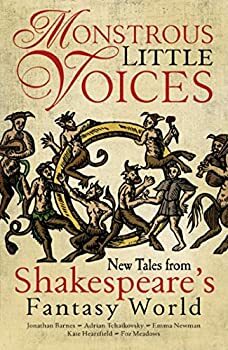 Even if you aren’t a Shakespeare fan, you’ll enjoy the stories in this collection, but those who are fans of the Bard will find this to be a rich feast. Publishes March 8, 2016. It is the time of Shakespeare. Storms rage, armies clash, magics are done – and stories are made. Five new great and terrible tales reshape the Bard’s vision, a new set of stories that will be told and retold down through the centuries. It is the Year of Our Lord 1601. The Tuscan War rages across the world, and every lord from Navarre to Illyria is embroiled in the fray. Cannon roar, pikemen clash, and witches stalk the night; even the fairy courts stand on the verge of chaos. Five stories come together at the end of the war: that of bold Miranda and sly Puck; of wise Pomona and her prisoner Vertumnus; of gentle Lucia and the shade of Prospero; of noble Don Pedro and powerful Helena; and of Anne, a glovemaker’s wife. On these lovers and heroes the world itself may depend. Monstrous Little Voices collects five of today’s most exciting names in genre fiction – Jonathan Barnes (The Somnambulist, Cannonbridge); Adrian Tchaikovsky (The Shadows of the Apt, Children of Time); Emma Newman (The Split Worlds, multiple-award-nominated Tea and Jeopardy podcast); Hugo-nominated blogger Foz Meadows (Solace & Grief, The Key to Starveldt’s); and upcoming novelist (and journalist for the Ottawa Citizen) Kate Heartfield – to delve into the world Shakespeare created for us. With wars and romances, its magics and deceptions, discover five stories he never told, but could have. Stories of what happened next or what went before, of the things unseen or simply elsewhere in the world as Shakespeare’s own tales unfolded on the stage. It was basically a labour of love! I noted the upcoming anniversary (next month marks 400 years since Shakespeare’s death), and Shakespeare being a passion of mine, asked my manager to let me do a Shakespeare project. We’re a genre publisher, so I mulled around “sci-fi retellings of Shakespeare” or similar ideas, until I realised that the source material was already fantasy, what with fairies, wizards, potions and the like. So I gathered my five writers, gave them a basic outline along the lines of “all of Shakespeare’s stories are set in the same world,” and invited them to pitch ideas, which I helped stitch together into a sort of coherent whole. So it wasn’t really based on the market, and was obviously a bit of a punt. It may yet prove to have been a terrible idea, although critical interest has been strong. ‘Monstrous’ is only a series inasmuch as the five stories are available as stand-alone novellas. There may be a follow-up – I have a concept for the next one in mind – but making any sort of decision is a way off yet. Thanks for chiming in and clarifying David. Just about the opposite of a terrible idea and I hope that next one comes together! Indeed–thanks for the clarification, sir! It’s a very intriguing concept, and I wish you luck with the follow-up!